Shorthorn cattle have the distinction of being the breed which were not only the first cattle to be introduced into New Zealand but which have been here continuously ever since – almost two centuries. During this period they have made an important contribution to both our beef and dairy industries. Today their numbers are diminishing, and the Rare Breeds Conservation Society must ensure that this breed, which historically has probably been the most important cattle breed in New Zealand, does not vanish altogether. The term “Shorthorn” as originally used, meant exactly what it says – it described cattle with ‘short horns’ (as opposed to those with long or middle-sized horns). 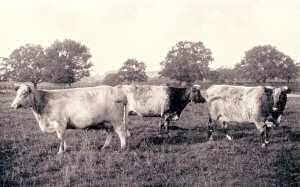 It included a number of ‘breeds’ of cattle, mainly from the English counties of Durham and York, which had a reputation of being very good milkers – as well as producing excellent oxen for meat and draught. The first Shorthorn cattle to arrive in New Zealand, still known at that time as Durhams, were introduced by Samuel Marsden in 1814. They came from the New South Wales Crown Herd and were a gift from Governor Macquarie. As dual-purpose animals, they were an ideal breed for the young colony of New Zealand during much of the nineteenth century. Shorthorn herds were well established by the early 1840s, and for a long time they remained New Zealand’s most popular cattle breed, although quite early on in this country the development of specialized beef and dairy Shorthorns was commenced. In 1913 Milking Shorthorn breeders in New Zealand formed their own association at a meeting in Palmerston North. 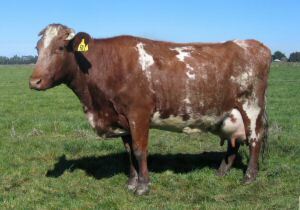 The Milking Shorthorn predominated in New Zealand’s dairy industry until the 1920s when it was superseded by the Jersey. From comprising 56 percent of all dairy cattle in 1921, the Shorthorn had declined to just three percent in 1963. Today, breed numbers have dropped even further. In the year 2000, registrations of purebred Milking Shorthorn cows numbered little more than three hundred. The New Zealand cattle industry owes a great deal to the Shorthorn. Now is the time for us to take action to ensure that this breed of historically important cattle survives in good standing as it moves towards its two-hundredth anniversary in New Zealand.